Not too sure about this outfit - maybe a necklace would have looked great with the top? It's definitely missing something. Swapped the pencil skirt out for a pair of skinny jeans when I went out shopping in the evening and felt much more comfortable Although I wore thongs to and from the office I wore these flats when I was at work, they stay under my desk for when I need a nice pair of flat black shoes. Managed to take this photo when I popped out the office for a bit of fresh air. Last worn: colour block top, pencil skirt, Alexander Wang Rocco. The rain wasn't going away by the time I got home in the evening, so had to take indoor photos. Just like when I started the blog! Only now the clothes rack is so weighed down it looks like it's falling on one side...and my shoe collection has expanded...haha. My push to get rid of most of my heels and replace all of my thongs with sandals and cute flats has meant I've run out of spaces for shoes. Starting to think I should get up earlier in the morning and get photos then, as it's difficult to get good lighting at the end of the day. Really liked this outfit, just not the photos. Tried to get a shot of my nails in the detail picture - got a free Ciate statement nail mani at lunch time. First time I've tried caviar polish, so I'm interested to see how it lasts! It's 'lemon fizz' I'm wearing, there is a better pic on instagram here. 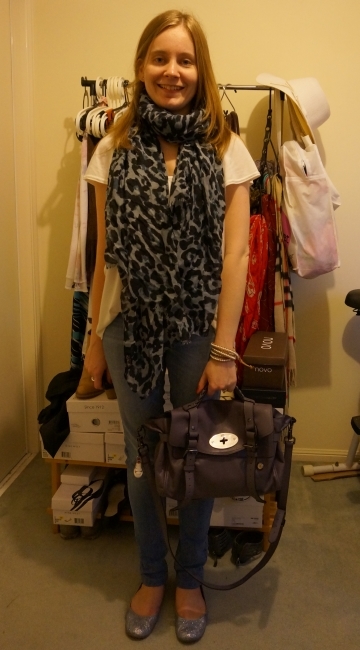 Last worn: top, skinny jeans, shoes, Mulberry Alexa bag. Mica, that colorblock top and plaid look great together. I would've never thought of that on my own. A necklace would go well with it. I saw your Ciate manicure on Instagram and it is so pretty. I haven't tried that brand yet. It's on my list. Great casual outfit! You have the best scarves! Have a great weekend! I love the pencil skirt. The first look is actually one of my favourites of yours. I think it is really classy and I love the colours. Lovely skirt and top - i could have sworn it was a dress as they look perfect together. BTW ... i just posted my inspired look by you. thanks so much! You look amazing, I prefer your look to mine! You look so chic in the first picture! Love the skirt, it is so gorgeous!! great top/skirt mix of your first outfit! and surely love your Alexa bag! And that's eery how you wrote a list and found it in a guy...because that's exactly what happened with Patrick. After my first boyfriend, I was frustrated with guys and wrote a list of characteristics I wanted in a guy. After I met P and we got together, I came across that list and was amazed to see how he fit everything I'd wanted. However, as you know, we're not together now, and its for the best. We just truly want the best for each other, and I'm certain there's more than I could imagine for myself out there! i love love what you wore to work on thursday! The first outfit is so classy!! Love your blog!! Hope you visit mine!! The first look is lovely! I would have added a chunky gold statement necklace just to finish it off but it does look fab the way you've worn it too! I HATE taking poutfit photos indoors, I tried that when I first started blogging too and never again! Ha. I love the nail caviars, they are so fun! And love the casual one too! Have a lovely Sunday, dear Mica! I love that first blouse! The colorblock is so chic!